Starr Hill Brewery now has a home in the Star City! 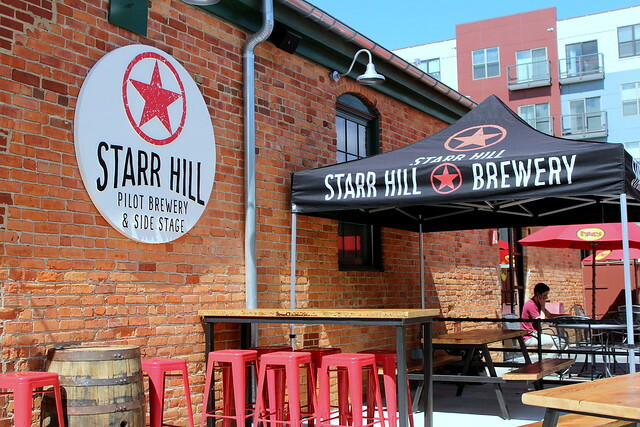 The Charlottesville brewery recently opened the Starr Hill Pilot Brewery & Side Stage in Virginia’s Blue Ridge as part of The Bridges complex along the Roanoke River and at the base of Mill Mountain. 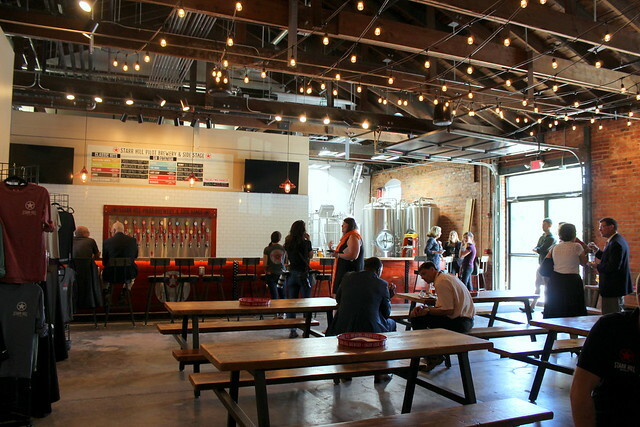 As a satellite taproom that will serve as a pilot brewery, visitors to this location will have the opportunity to enjoy many of Starr Hill Brewery’s popular flagship brews in addition to trying new, small-batch, experimental beers that are brewed onsite in the custom 5-barrel brewing system. With 23 rotating taps, you’ll be able to order pints of Starr Hill classics like The Love, Jomo, and Northern Lights IPA, while also finding some new brews that will be made specially for this location. 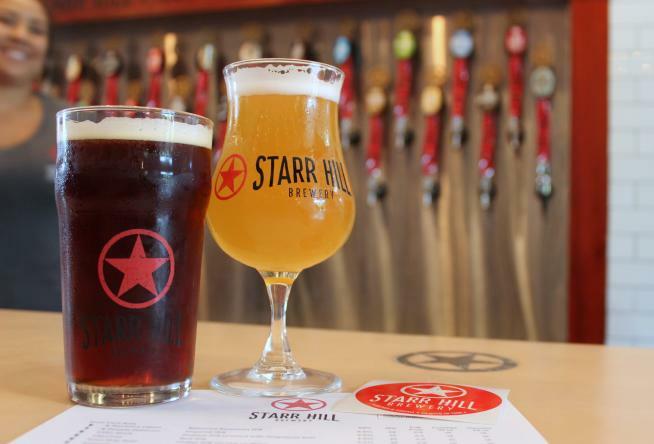 Starr Hill Brewery offers a variety of kinds of beer, including IPAs, Lagers, Ales, and Stouts. The menu features 12 oz. and 16 oz. pours, as well as crowler (32 oz.) and growler (64 oz.) fills. Prices for most pours range from $5 to $8. You can also ask the bartender about the option to create a custom flight. A 5-beer flight of 5 oz. pours is $10. The concept of the Pilot Brewery & Side Stage will focus on showcasing new beer and new music, and there will be regular live music weekly, plus larger seasonal events and concerts paired with special release beers. Take in some great beer and music, and remember to pick up some Starr Hill Brewery swag! There is all kinds of cool merchandise, such as shirts, hats, glasses, growlers, crowlers and more. Here are a few other details to help you plan your visit. The Tasting Room is located in The Bridges development in the same building as Moe’s & Starbucks across from the Virginia Tech Carilion Research Institute. Monday - Thursday: 3:00 p.m. - 9:00 p.m.
Friday - Saturday: 11:00am - 9:00 p.m.
Sunday - 12:00 p.m. - 7:00 p.m. In addition to serving craft beer, Starr Hill is also joining the vibrant live music scene in Virginia’s Blue Ridge and will regularly host performances on its side stage. Visit the Music page on the brewery’s website to learn more about upcoming concerts. There is a small, outdoor patio space where pets are allowed. Guests should keep them on a leash and they are not allowed inside the tasting room. 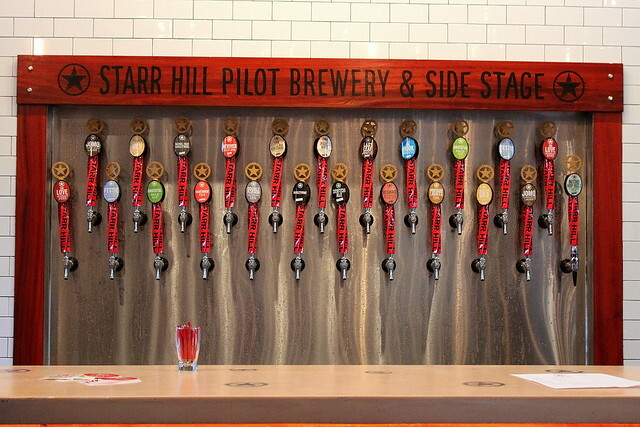 The Starr Hill Pilot Brewery & Side Stage is conveniently located near many other fun spots in Virginia’s Blue Ridge! Make the short drive or bike ride over to the Historic Market District in Downtown Roanoke for lots of fun dining, shopping, and museums. You could also access the Roanoke River Blueway from the public kayak launch located at The Bridges or attend a concert at Dr Pepper Park. And don’t forget to head up Mill Mountain to check out the iconic Roanoke Star, the Mill Mountain Zoo, and the great trails for hiking and mountain biking in Mill Mountain Park. Virginia’s Blue Ridge is an awesome destination for a beercation! Check out each stop on Virginia’s Blue Ridge Beerway and become an expert on the local beer scene by taking part in a Roanoke Craft Beer Tour. You can even combine our incredible trails with craft beer by using this guide on the best local spots for Mountain Biking & Beer.